What did you do to your Finnie today? Just what could be a fun little topic stolen from just about every car forum there is. Good for the little bit of information that doesn't warrent a whole thread dedicated for it, or even for sparking ideas in others that could make a good thread topic. Today - Nothing, but i was going to start this off last weekend so i'll backdate a little. Last weekend - Saturday. Made the mistake of trying a new polish on the bonnet of her. It worked well. So well, as good as she looked before, it looked stunning after, which made the guards look bad, so they got a polish too, next thing you know i'm polishing the bootlid, i'm buggered, my arms are killing me, and my saturday is gone. I'm sure there is a lesson to be learned there somewhere! Sunday - Went on a club run to Lithgow Zig Zag railway. Got waved down by a campervan full of lovely Germans on holidays who desperately wanted to have a look and get some photos (about half hours worth). Met a gentleman from a Mercedes club (won't speak of that ) had a guy in a cadillac convertable crawl all over it. Due talking to everyone there that wanted a look, and chat, i missed the train ride! But chatting to these people and hearing their stories is half the fun of a car like that i think. Funny that it got more attention than the new Aston Martin DBS, Bentley Continental, Audi RS5, and AMG C63 that was also in the car park. After a 250 mile round trip, she performed faultlessly, pulled up scenic hill (out of lithgow on Bells line of road for those that know the area) effortlessly in third, easily pulling away from the other club cars. Made it home, cleaned the bugs off and put her back to bed. Re: What did you do to your Finnie today? I start it and run it up to temp each weekend so it's running well but i have been thinking of making it into a station wagon after seeing that W110 wagon conversion on ebay a couple of weeks ago. I would swap it for a Car-o-liner or autoliner pull bench if anyone wants to do a deal for a good running almost rust free finny. In the meantime I am thinking of mothballing it until i can clear few projects out of the way. Brad, Great to hear of the enjoyable drive. I am just the other side of Bells Line of Road, and happy for any excuse to punt the finny along there, so if you are heading to Lithgow or ZigZag again let me know and we'll catchup. The car just about knows his own way -I think we visited Lithgow 5 times last year. These cars cover great distances just so easily. Last year I visited the South Coast, Southern highland, the Hunter and the central west, often doing 1500km in a weekend. They are just so enjoyable to drive -my W126 might be more comfortable -but it is not a patch on the 220S for enjoyment. W111 1961 220S Classic Rally Car "Eugen"
I changed the Shocks, front and back, took her for a spin to Geelong and what a difference. Just handled so well !! Have so many more task to do feels like a long way to go !! but getting there !! I went to visit my 300 which has been in the shop for a month. Complete tune, cold start adjusted, fuel pump fixed, water pump leak corrected with reco pump, radiator leak repaired, and a few trims replaced. Can't get over how quiet it is now. Very smooth and chomping at the bit to get out for a drive. Hopefully have it back tomorrow. That one has been re-listed. It would be a nice little project for someone who wants something a bit different. It would go well with a 220, 230 or 280 in it. Would go well with anything other than a 240D motor. has the new configuration been cutting posts from the forum? Mercmad wrote: has the new configuration been cutting posts from the forum? Oh well here goes, i got my 'new' station wagon up from melbourne OK,on a trailer with a rented Toyota . what a ride! these things no longer have springs under them i think. Even with a trailer my teeth were rattling from Brisbane to melbourne and back. After finding that I am going to strip it and sort out any other EFFUPS that have been done to it. Another minus is the generator. i am going to fit a alternator and fix any Murphys lurking there. if anone is wrecking a W115 i would like the front engine mount under the damper if they have one, this one has the engine bolted solidly to a piece of flat bar in turn bolted to the front crossmember. ...talk about noise and vibration! it stated OK with a bit of help as the glow plugs appear to have been wired wrong without the resistor .I may go to the later pencil type for faster more efficient starting. The trailer was great though,probably the best hire trailer i have used in OZ. light and easy to tow, i think the company is based in melbourne. That conversion really works! I reckon the rear end looks just as good as the IMA universals, a very tidy job indeed. I had seriously considered this car, if I hadn't just bought my red 190c, I probably would have gone after it bigtime! The only thing that I didn't like about the conversion is that as it was originally a sedan, the rain gutter stops over the rear door, but it still does blend in ok.
Good to see another W110 receiving some much needed love and attention! YES!. i have mate who has several hundred (yes 100'S!) of old holdens outside Brisbane who will have those venetians so I am going to hit him up for a set. So far i am quite happy with it and i've just got a set of mount arms for the engine for free. I am going to convert the glow plugs to the later pencil type once I sort the engine out . These work well in the later Diesels,even in the seriously crappy SSang Yong motors. I have been looking at running Waste oil and /or vege oils to save the planet . 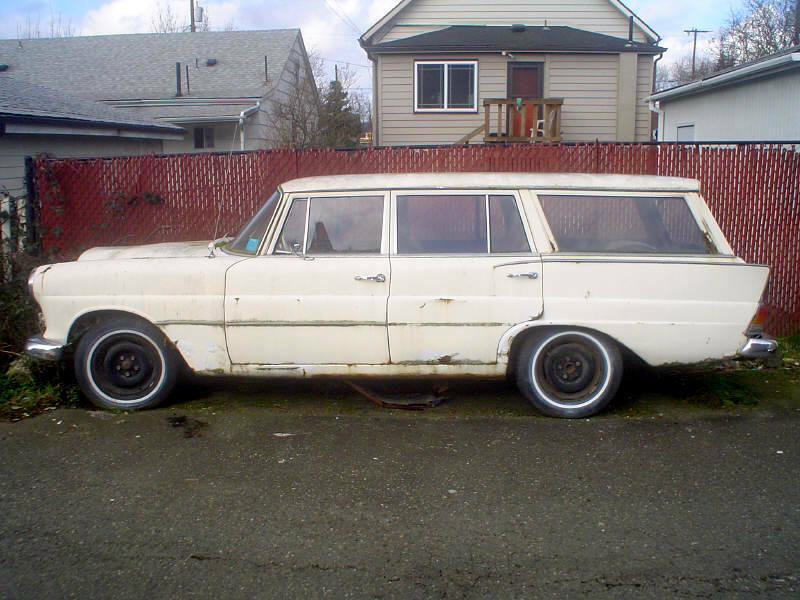 The seller also has a reasonable ponton wagon for sale too. I started on cutting the rust out in the rear beaver panel. Not much material left and still some more to go, but i dont want to get to far ahead until i cut out the replacement beaver from the parts car. Its really just a matter of having enough patience to unpick the spot welds. It was daunting making the 1st cut, but from then on, the metal was flying off. Currently undergoing a Toyota V8 conversion and then paint. Fresh from its annual roadworthy inspection last week (passed as usual) -it was time for a drive. So after a delayed start from NW Sydney, we headed off to Bathurst to see the F1 at the mountain yesterday. I was not able to leave until 10:20 -so I was very late arriving at Mt Panorama at around 12 noon. I missed all but the Lowndes laps in the F1. And then headed home at 1pm. So nearly 4 hours driving for 8 minutes of F1 action at Bathurst -was it worth it ? Absolutely In fact 4 hours driving the Finnie was fun in itself, covering around 215 miles. Not without a minor issue though, with the generator light on most of the way home. I think its just the regulator, anyone got a spare? Other than that I had a ball -and the F1 car was good too. I have few spares but if there is FX-EK holden nut near you,borrow one of theirs,it's the same bit . Mercmad wrote: I sold it!!! Otherwise i would have made an offer. We ended up with a diesel turbo 4wd. Well, over the last few days I've been trying to finish up my engine swap (m110). Sunday; did a trans tunnel mod to bulge the tunnel out to clear the flex disc at rear of trans. I did this in my mate's pit with a spoon dolly and mallet, with him sitting in the car with a palm dolly, turned out great, and now has plenty of clearance. Monday; tried to fit the 108 shaft I'd been told would fit up, but to my dismay found it was too long by about 10mm and put too much load on the engine mounts and centre bearing. I ended up having the original finnie shaft shortened and flange to mate the m110 grafted on. Also degreased the tunnel and under cariage. Tuesday; fitted the newly shortened shaft, perfect fit. Then after a little fiddling turned the new engine over for the first time, and ran it for a few seconds (it was late in suburbia, and the exhaust was disconnected). Big smiles all round to hear it running. Still need to connect up alternator, kick down switch, speedo cable and coolant temp guage, then test drive. Can't wait. Oh and put in the 6cyl springs, has a v8 front end in at the moment and is sitting up high. I found one needing a new home. Mate, just weld up the doors and rat-rod it! Fantastic news on your build Dylan, is she running on straight gas now? Can't wait to see your orange stunner on the road again! Where in Qld in that? Looks like a BMW 3 series up the date too. ^^^ That's too nice to be rat! Gee, I don't feel very original anymore! It even has the red stripe I was going to do. Should I go back and repaint it??!!! Yours is too nice, too polished. Keep at it. A Rat Rod for the "Well to do". You can all breathe. I didn't Rat Rod a 300.That's my 300 in the background. Some years ago I sold a matt black finny on ebay. A couple of years later anther owner of it showed up at my place looking for a radiator. It would be interesting to know of where it is now as it was one of the few to come to Oz with the 300 SE trim on it. I sold it with all of it's trim not fitted and complete set of 300SE trims including the sill covers.It was distinguishe from a regualr finny by the holes along the flanks to fit the side trims. back to the topic.. I spent sometime over the weekend cleaning the tail lights on the wagon. The tail lights were covered in etch primer so i decided I would try and clean the stuff off. Thinners wouldn't soften it so I tried heavy duty paint stripper. That softened it but also melted the plastic lens. i polished the lens back again with a soft mop and jewelers rouge. I got the infamous G wagon running and after a bit of run to seat the rings etc I used it to tow my Station wagon up the street and into the drive. My God a OM617 with a tractor gearbox is unstoppable!! !.It pulled the wagon sideways without a change in engine note. Vehicle' or what about a 'sideways' finny towing service!!! 65Finnnz wrote: what about a 'sideways' finny towing service!!! You can just go and post comments like that elsewhere! Finnies never break down, they just require the correct persuasion. my black finny would have looked like this..
As I mentioned above,these were a low volume car ,the only piece (apart from the star) is the door trim. The C pillar air vent is the 300SE lang ,as was mine ,and doesn't have a Chrome trim . but has the chrome window trims. The finny in the pic is almost totally original and lives most of the year in Monaco. 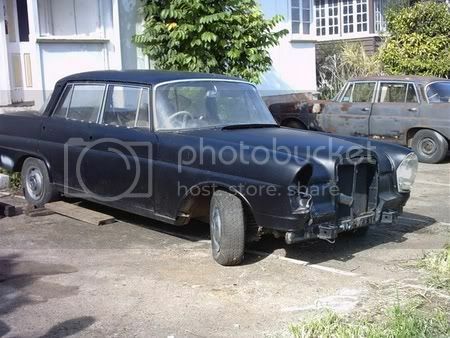 Mercmad wrote: As I mentioned above,these were a low volume car ,the only piece (apart from the star) is the door trim. The C pillar air vent is the 300SE lang ,as was mine ,and doesn't have a Chrome trim . but has the chrome window trims. The finny in the pic is almost totally original and lives most of the year in Monaco. Interesting, I dismantled (please note I did not "wreck" it) a 220SEb many years back that had 300SE trim and a carpeted boot that looked factory. I always presumed that someone had dressed it up to look like a 300SE. My logic was that MB would not dilute the pretige of the 300SE by offering the trim as an option on lesser models. Do you now what the option code was?? Or maybe it was a dealer fit thing? On the subject of 300SE trim, does anyone know where I can get the clips that hold this trim on? Mick_Marsh wrote: On the subject of 300SE trim, does anyone know where I can get the clips that hold this trim on? Yes , nearly all are still availble.. I am sure they were ordered especially with the trim fitted from the factory,there are a lot of holes in the 300 doors and guards,far too many for some one to sit down and mark them out ,then drill them accurately.. I have lost track of the one I had although a person who was a couple of owners down the line from me ( it has changed hands a lot ) popped in one day to buy a radiator. I should have kept a note of the options because it had the option plate and it was pretty full. 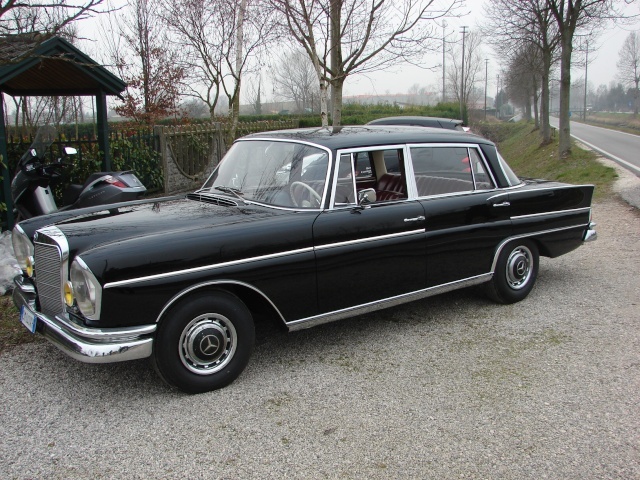 It was a 1965 and had the later MBtex interior with the perforated seats etc. It may turn up again one day as it really only needed to be clear coated to finish the paint. Not mine,But I spent most of the week assembling a m189 Short block for a W112 . I finally got the W115 240D i bought deliverded . I am going to use the engine in the W110 wagon ,plus the starter knob etc. Anyway,this car has been sitting on a farm somewhere out west for the last 8 years unused. i grabbed the fan and was able to turn the engine bit so it wasn't seized. I hooked a battery to it and ....nothing. I pulled the giant starter out and it had a couple of fried connections to the brushes. I resoldered them,reinstalled the starter and turned it over...and it runs!!!!!!! i dont like the guys across the street in the motorbike shop so the large cloud from 8 year old diesel was allowed to drift into their workshop like a vision from Bob browns nightmares. I am wanting to get rid of the rest of it as soon as possible so if anyone wants a cheap parts car give me a hoy. It's been looked after until it was parked because of the crook starter but the body is rotten underneath . A shame really because i would probably fix itr up other wise... come on,this thing even has twin mirrors!! Nice! The rocker cover doesn't look too filthy so I hope that means there wasn't much blow-by. Is the W115 a floor shift manual? Good to see it has the P/steering pump too in case you ever wanted to convert it. UPDATE : a valve adjustment , fresh battery and it started and runs beautifully!! Very smooth and un diesel like . The governor diaphragm is a bit suss i think,but no big deal,it runs cool and smoke free even when revving. I am going to enjoy this adventure into the station wagon world!. The Chain is perfect too!. Well..changed the very buggered diapragm and went for a lap up the street. The car drives really nicely with great steering and good brakes .Plus the auto runs so nice i'm going to keep it with the engine and put both into the station wagon. i am surprised,it runs really nicely with plenty of torque. SO... i have a OM615 engine and manual trans for sale. The deal will include the manual pedal box and master cylinder. The engine was completely rebuilt at some time and has only run for a few minutes. It needs proper bearings because although it has a reground crank,someone put standard shells in it. make me a sensible offer and you may own a great little motor suitable for a roundie or finny with the option of the sporty four speed gearbox..
Front brakes apart to get the shoes re-lined and cylinders repaired. Typically took about an hour to pull one side apart and 10 minutes to do the other. Hopefully she'll pull up in a straight-ish line soon, and hope i remember how it all goes together. Does that have those self adjustor washers? Make sure they are in good nick,along with the return springs,if not you will have all sorts of hassles getting the car to pull up straight. Not mine, but Drews Cherry bomb, I stuck a new trans in it. Bit of bugger in this cold weather while fighting off the flu . Just back from a 2 day rally -covered just over 1000km. Very cold, with the rally starting at Lithgow am 9am Saturday, then through Oberon, Crookwell and on to Queanbeyan overnight. Then, from Queanbeyan to Cobbity today -plenty of nice quiet country roads. Some great driving roads, a few hills and just a little unsealed. 500SLC from this forum also had a run. Plenty of positive comments from the other competitors about the 50 year old Finnie, and how great it sounds. Installed new front wheel cylinders and brake shoes, all went well until bleeding and found there was a blockage in one hose. Annoyingly, possibly most of the reason for the problems. $470 to find i possibly only needed a cheap hose. Luckily our sponsors have them in stock. And at half the price i was quoted for getting new ones made.